Refine your dining space with the Victoria Side Chair. Featuring a Legacy Copper finish, this shapely chair brings a unique traditional look to your home. 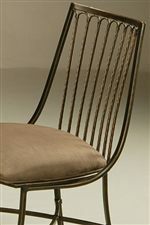 A wing-like back with skinny slats gives the piece a refined, formal feel, and curved legs with support stretchers add additional shape and dimension. A light brown upholstered seat ensures long lasting comfort while also providing an complementary contrast to the chair's metalwork. Traditionally styled with a quiet elegance, the Victoria Side Chair brings instant class to your dining area and uplift and polish your home. The Victoria Upholstered Side Chair with Slats by Pastel Minson at AHFA in the area. Product availability may vary. Contact us for the most current availability on this product. Finish Features a Light Copper Finish. Vivify your dining space with the Victoria collection. Crafted from metal with a Legacy Copper finish, this collection features classic pieces with a traditional, classy styling. 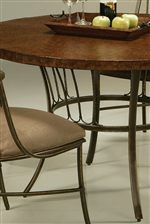 With features such as a pedestal base, curved legs, and hammered metal tops, this dining collection brings a unique look to your dining room while still maintaining a classic and formal design. Let the essence of Victoria bring your dining space to a new level. The Victoria collection is a great option if you are looking for Traditional furniture in the area.